Buckingham Capital Partners is a private investment firm that specializes in leveraged buyoutsLeveraged Buyout (LBO)A leveraged buyout (LBO) is a transaction where a business is acquired using debt as the main source of consideration. An LBO transaction typically occur when a private equity (PE) firm borrows as much as they can from a variety of lenders (up to 70-80% of the purchase price) to achieve an internal rate return IRR >20%, management buyouts, recapitalizationRecapitalizationRecapitalization is a type of a corporate restructuring that aims to change a company’s capital structure. Usually, companies perform recapitalization to make the capital structure more stable by exchanging one type of financing for another. One example is when a company issues debt to buy back equity shares. transactions, and acquisitions of lower and middle-market companies in the United States. The firm seeks to invest in industrial and manufacturing companies in the $10 million to $100 million valuation range. Apart from capital investments, Buckingham Capital Partners supports its portfolio of companies through strategic insights and the experience and knowledge of its partners and professionals. The firm invests in equity, and partners seek a controlling stake in companies with strong management teams. A leveraged buyout is a transaction in which the acquisition of a company is financed using a combination of equity and debt. The acquirer uses the company’s cash flow as collateral to secure and repay the borrowed money. Companies use debt capital in financing the acquisition of another company as a way of making large acquisitions without committing a large amount of their capital to a single transaction. Buckingham Capital Partners uses such a strategy to purchase a controlling stake in a company. The firm considers buyouts of companies with revenues in the range of $5 million to $100 million and EBITDA that is greater than $2 million. Recapitalization refers to measures taken to restructure a company’s debt and equity with the aim of making the capital structureCapital StructureCapital Structure refers to the amount of debt and/or equity employed by a firm to fund its operations and finance its assets. The structure is typically expressed as a debt-to-equity or debt-to-capital ratio. Debt and equity capital are used to fund a business’ operations, capital expenditures, acquisitions, more stable. One way to achieve a stable capital structure is to exchange one form of financing with another, more stable, form of financing. Recapitalization transactions are important when implementing an exit strategy for investors. 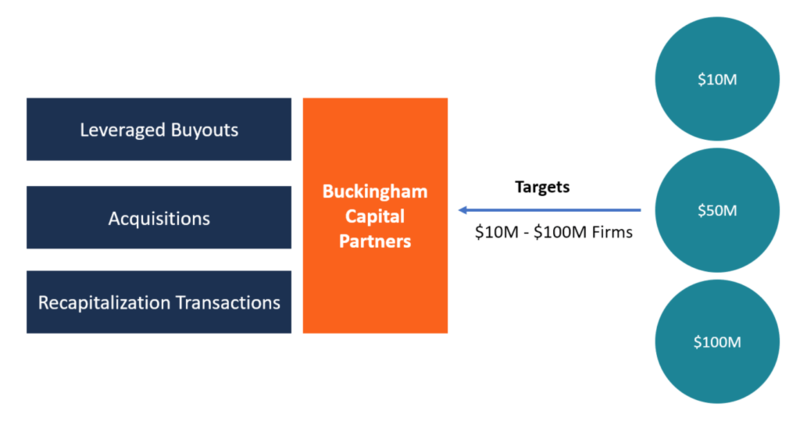 Buckingham Capital Partners uses recapitalization transactions to strengthen their acquisitions or when implementing an exit strategy in some of its portfolio companies. An acquisition is a company action that involves purchasing a controlling equity interest in a company. The acquirer implements an acquisition by purchasing the shares or assets of the target company. The purchase must give the acquirer more than 50% ownership of the company to give them control of critical management decisions regarding the company. Acquisitions allow Buckingham Capital Partners to participate in major decisions such as strategic planning and capital allocation, as well as the hiring and compensation of senior company executives. For the partners to consider making an acquisition, the target company must show a long business history and high growth prospects, and be a strong competitor in its niche markets. The company must have equity commitments of $2 million to $15 million. The company must have a valuation of more than $2 million after adjustments. The company must be in the low to medium technology industrial and manufacturing businesses. The company must be a strong competitor in the markets they are engaged in. The company must have a growing cash flow and diverse group of customers. The company must be domiciled in the United States. Shail Sheth is a co-founder and managing partner of Buckingham Capital. He is also the co-founder and general partner at Max Capital. Before starting Buckingham, Sheth worked as an investment banker and private equity principal in various private companies such as Max Capital, Furman Selz, Brean Murray, Foster Securities, and Chatfield Dean & Co. He graduated from the College of William and Mary, and received his MBA from the Yale School of Management. Albert Naggar is also a co-founder and managing partner of Buckingham Capital Partners. He also works with Sheth at Max Capital as a Partner. In addition, Naggar is the founder and chairman of Process Equipment Company. Before joining Buckingham, Naggar worked as an investment banker and private equity principal at Lazard Freres, LLC, Chemical Bank Corp, Furman Selz Inc., and Goldman Sachs International. Naggar is a B.A. graduate of Brown University and earned an MBA from the Columbia Business School. Michael Liang joined Buckingham Capital Partners in 2004 and serves as an associate. Previously, Liang worked as an investment banker at the Group Markets Capital Group in their acquisition group for the biotechnology and defense industries. He was selected for the Secretary Elaine Chao Internship program at the US Department of Labor. Liang received his bachelor’s degree in Finance and Information Systems from the New York University Stern Business School. He is a CFA charter holder and a current MBA student at the Columbia Business School. Victor Kiam is the president of Kiam Ventures LLC, a diversified investment holding company, and Lia Sophia, a party plan jewelry company. Previously, Kiam served in senior management positions at Remington Products Company and Drexel Burnham Lambert. He possesses a wealth of experience in marketing and corporate development. Richard Lewisohn is the senior managing director at Burnham Securities Inc., which deals with asset management, brokerage services, securities underwriting, and mutual fund administration and distribution. Previously, Lewisohn was a partner at Herzfeld & Stern and the Director of Investment Banking at Gruntal & Co. He also participated with Buckingham’s principals in the acquisition of ESCO Corporation. Lewisohn is very experienced in offering advisory services to lower and middle-level companies. Sir Harry Solomon is a co-founder and former CEO of Hillsdown Holdings Plc, a leading European food company with over $3 billion in annual revenues. He was also a sponsoring investor during the establishment of Max Capital. Solomon also serves as a director of several consumer and industrial products manufacturers. Mark Tagliaferri serves as European Partner of Global Innovation Partners, a $526-million US private equity fund. He also sits as chairman of Active Asset Investment Management. Previously, Tagliaferri was managing director at Terra Firma Capital Partners and Nomura Private Finance Group. He is also the founder and CEO of Dawnay Day Corporate Finance.